For a country undergoing or emerging from a period of conflict and repression, it is likely that a number of rights violations have taken place. Rather than punish perpetrators in court for these rights violations, some states instead opt to issue amnesties. Amnesties—considered to be one of the more controversial tools of transitional justice—are legal protections that safeguard designated groups or individuals from criminal prosecution for certain crimes. In some cases, amnesties can protect actors from civil or administrative actions as well. Depending on the political context following a period of repression and conflict, amnesties may be able to serve as a complementary transitional justice tool to support other mechanisms of justice; however, if abused, they can entirely fail to guarantee justice for the victims of crimes and further a culture of impunity, ultimately eating away at judicial institutions and contributing to unresolved demands for justice within a society. 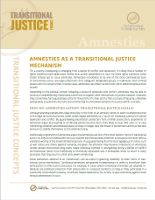 How Do Amnesties Satisfy Transitional Justice Goals? Although granting perpetrators legal immunity in the form of an amnesty tends to seem counterproductive to the legal and judicial process, some states regard amnesties as a “quick fix” following a period of intense repression and conflict. By guaranteeing perpetrators protection from criminal prosecution, proponents of amnesties argue that warring or conflicting parties become much more likely to drop their arms or to stop committing violations and embrace peace, as they no longer face the threat of punishment and thus feel less pressure to solidify themselves as the dominant party. Additionally, proponents of amnesties argue that amnesties are one of the most realistic forms of transitional justice, as they do not overburden the court system and instead allow attention to be paid to the most serious violations worthy of the state’s limited resources—thus guaranteeing that the most egregious of crimes, such as war crimes and crimes against humanity, are given the attention they deserve. Proponents of amnesties further explain that prosecuting every single individual involved in wrongdoing during a period of conflict and repression tends to be realistically or technically impossible and, if attempted, tends to result in hasty processes that may result in unfair and uneven sentencing. Some amnesties—referred to as “conditional”—can be useful in granting credibility to other forms of transitional justice mechanisms. Conditional amnesties are granted to perpetrators in order to incentivize their participation in other justice processes. For example, in cases where conditional amnesties are adopted, individuals are promised protection from prosecution or a reduced sentence so long as they participate in a community reconciliation process, contribute toward reparations for victims, or give testimony against more serious perpetrators in court. Finally, amnesties that are granted for persons accused of or punished for committing purely political crimes prior to a period of conflict and repression can often help right a wrong and undo a previous false prosecution or imprisonment of an individual who was targeted for exercising his internationally recognized rights. Although rare, these types of amnesties are strongly encouraged by Additional Protocol II of the Geneva Conventions. What Are the Downfalls of Granting Amnesties? Because most amnesties effectively enshrine into law a means of avoiding prosecution for the commission of crimes, they can detract from the strength of the judicial system and the overall trust of the society in state institutions. Additionally, if amnesties are relied on as one of the sole methods of transitional justice following a period of conflict and repression, they encourage a culture of impunity and violate the rights of victims to see perpetrators tried for the crimes that were committed against them. By creating a mechanism for avoiding traditional accountability, amnesties allow demands for justice to remain unresolved and can contribute to a festering instability within the society. More specifically, there are certain types of amnesties that carry inherent limitations. “Self amnesties,” for example, are those in which a political actor grants amnesty to himself and his allies while failing to grant amnesty to those on an opposing side; such a scheme immediately politicizes the amnesty and discriminates against perpetrators, thus failing to treat citizens equally before the law. Self amnesties also encourage the concept of “victor’s justice,” in which only the party emerging from a period of conflict and repression as the victor is not held accountable for violations committed, while those considered to be the loser are disproportionately punished. “Blanket amnesties,” those granted to large groups or categories of perpetrators without preconditions or restrictions, can often encourage a culture of impunity and allow perpetrators to believe that they do not owe the society or victims anything. Blanket amnesties granted on a group basis can often conceal and protect individuals guilty of severe crimes. Even when amnesties are carefully considered, granted with very specific conditions, and coupled with other forms of transitional justice, victims are often absent from the conversation. As a result, even amnesties that are crafted per certain theoretically ideal models can still fail to meet and resolve victim and community needs. How Do We Measure the Success of Granting Amnesties? There are a number of factors to consider when evaluating the success or strength of an amnesty as a tool of transitional justice. First and foremost, it is important to establish that the amnesty was not granted to the perpetrator of a severe crime. Second, the issue of whom the amnesty was granted to and by whom it was granted is vital in determining the equity with which the measure was enshrined. Third, it is important to identify whether the amnesty’s conditions prompted actors to indirectly or directly contribute to the justice process by furthering reconciliation objectives, reparations, truth seeking, or other criminal trials. Fourth, the voices of victims and local communities should be incorporated into the amnesty-granting process. Finally, and overall, the amnesty should not delegitimize judicial institutions, eat away at rule of law, or strengthen a culture of impunity. International Center for Transitional Justice. Amnesty Must Not Equal Impunity (fact sheet). January 1, 2009. https://www.ictj.org/sites/default/files/ICTJ-DRC-Amnesty-Facts-2009-English.pdf. Office of the United Nations High Commissioner for Human Rights. Rule-of-Law Tools for Post-Conflict States: Amnesties. New York: United Nations, 2009. https://www.ohchr.org/Documents/Publications/Amnesties_en.pdf. United States Department of State. Transitional Justice Initiative. “Amnesties” (policy paper). May 17, 2016. https://www.state.gov/documents/organization/257776.pdf.